Spitfires sharing an airfield with Douglas A-20 Havocs get a taste of "sunny" Italy, winter 1944-45. Spitfires sharing an airfield with Douglas A-20 Havocs get a taste of “sunny” Italy. The winter season of 1944-1945 was remembered as particularly wet and muddy. Due to the widespread use of airfield surfacing materials, the air operations towards the end of the war could continue regardless of the conditions such as this. The A-20 is from the 87th Bombardment Squadron/46th Bombardment Group which was a training unit stationed at Morris Field, North Carolina. 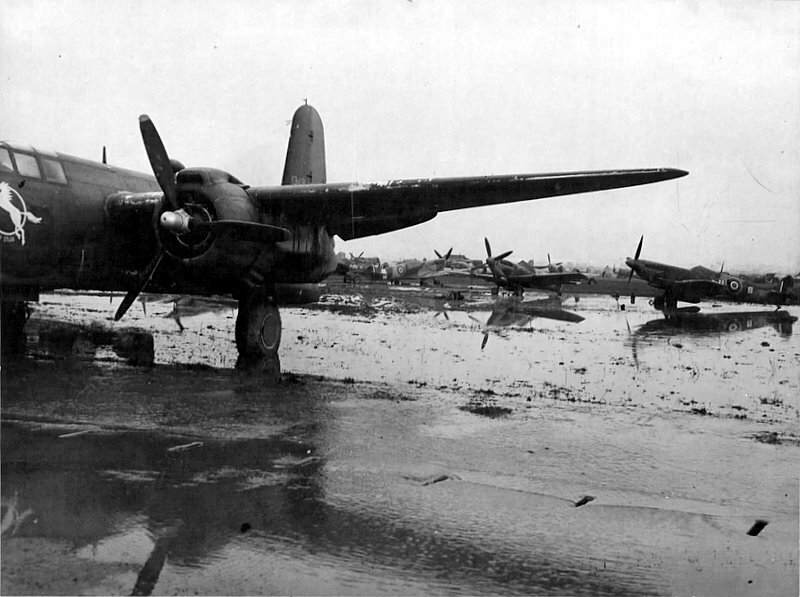 It was disbanded 1 May 1944 so I am assuming the aircraft was relocated to Italy, probably under the 47th BG. If I had to guess this is probably Grosseto.